Welcome to this edition of Style Imitating Art! Style Imitating Art challenges us to look to create an outfit using art as inspiration. In addition to colors, you may also want to look at textures, mood, style, genre. There are no "wrong" outfits, and you don't need to be literal. 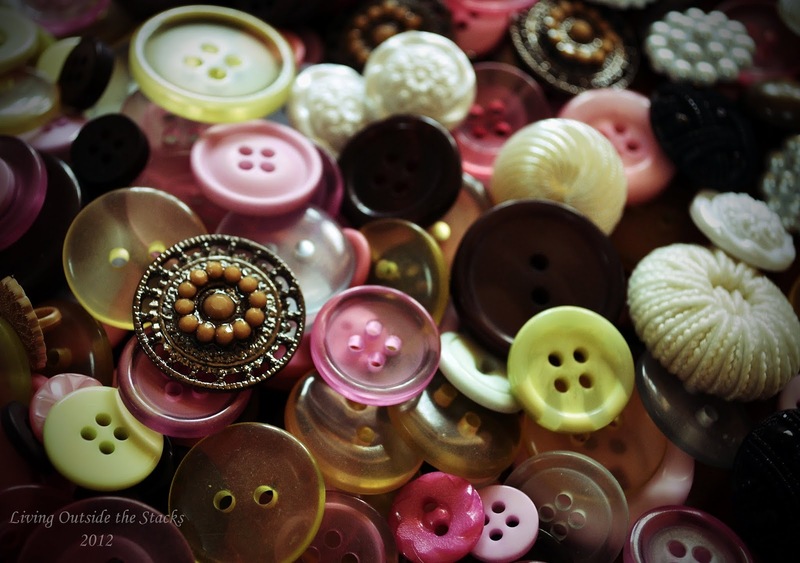 Today's inspiration is the photograph Buttons by Dani Vaughn-Tucker. It includes chartreuse, gold, amber, ivory, brown, filigree, dark and light pink, beaded/pearl textures. What elements did you, or would you, select? This week's art was curated by Daenel at Living Outside the Stacks. She's selected it because it reminds her that spring is on the way! You know how I've kissed a lot of fashion frogs lately (Macy's, Old Navy, Nordstrom Rack)? Fortunately, for me and my wardrobe, a few princes have shown up. Starting with these cabi Tracker pants in the color Midas. I was on the hunt for an ochre-colored pair of pants and these are very, very close. I had a little trepidation with sizing, as I ordered a size up to get the waist to fit. It did. I then had to take the sides in a bit. The pink top is also cabi and it ran big. It got taken in, as well. The Charter Club silk cardigan was picked up at a consignment store this weekend. Gold pearl beads are Joan Rivers brand, to which I added a leather extender. I've been really liking the scarf/sash belts I've been seeing around, so in an effort to marry the top and pants, I picked up 1/2 yd. (45 cm.) of 45" (114 cm.) batik fabric* and made this belt. Sandals, thrifted. *For those of you who sew, I cut the 1/2 yd. (45 cm.) in half length-wise and sewed the ends together. Then, the long strip got trimmed to 6 1/2" (16.5 cm.) wide. It was then folded in half and given a 1/4" (.6 cm.) seam leaving both ends open (no interfacing was needed, because the fabric had enough body) and turned so the right side is facing out. Trying it on with my pants, it was threaded through the belt loops and tied to see how long I would like it. I cut about 4" (10 cm.) off each end, trimmed the edges at 45°, hand turned a 1/4" (.6 cm.) seam and top-stitched them closed. There's still time to submit your outfit for Style Imitating Art! Please email your outfit selection to Daenel at livingoutsidethestacks@gmail.com by Tuesday, March 12, to be included in our roundup. You don't have to be a blogger, or an Instagrammer to join us, you just have to like clothes!